An interview with Hieromonk Sava of the Great Lavra and Fr. Nikodim of Romanian Skete of St. John the Baptist on the Holy Mountain answered questions, while at a conference in Romania. The Conference was held in Bucharest on October 15th, 2016. Interview: In Encyclical of the Patriarchate of Constantinople in 1920 it is said that the first step in uniting with the heterodox is the adoption of a common calendar with them. Do you think that the Calendar Reform implemented in 1924 in the Orthodox Church was a manifestation of ecumenism? Answer: What is happening to us at the Council in Crete is but the steps of the eleventh hour. In fact, the rise of ecumenism started all the way back in 1902 with Ecumenical Patriarch Joachim III, who was also a mason. Next followed the first step which was to formalize ecumenism by the change in the Calendar and the move to change the Calendar. This was followed by another nine steps, which led to the repeal by Patriarch Athenagors of the mutual excommunications, or the removal of the anathemas between the Orthodox Church and the Papacy. I now come to the latest step which is the Cretan Synod, which has opened the door for the ecumenist heresy to penetrate inside the Church. Interview: Is someone a Christian, regardless of their hierarchical rank, if they persist in heresy after the first and second admonitions? Are they an heretic even if they have not been convicted by a conciliar decision, or if there is no formal excommunication? Answer: It is important to listen to what the Church say, and not what we say; the Church says that a man who preaches heretical dogma is an heretic. If a priest or bishop does this, he should be deposed by a Synod and subject to Synodal condemnation, which would deprive them of their position. If this does not happen, it does not mean that they will not be considered convicted by Christ the Saviour, and that they are not heretics. He is an heretic on the basis of what he does, even if he is not deposed. The Synod has to depose him, it’s not we who decide this, but, it is to be the Synod. Do two, three, or more bishops, who interrupt communion with ecumenists have the right to convene a Synod that condemns the ecumenist heresy and all the ecumenists? If that happens, then how do ordinary Christians relate to the decision of such a Synod, particularly if the heretics from the “Official Church” teach that such Orthodox bishops are ‘schismatics’ and other kinds of slander? Answer: Church history shows that it is necessary to organize a major Synod to be able to make a decision of this type, so that it could be rejected as well as the Cretan Synod. It will be essential for those bishops who reject the Cretan Synod to officially break communion, that is communion with those who have accepted the false Synod, and with those who did everything could to help convene the [Cretan] Synod. This is how the Church operates. At what point does the Grace of God leave the heretics? We do not go to them, because of their heretical thought, but if we go to the temple, where these heretics are, it means we take part in the exercise of their wretched desired that they want to impose upon the Church. This must be clear! Canon 15 of the First-Second Synod says that a when a bishop publicly preaches heresy in the Church that we need to distance ourselves from him and interrupt all communion with him. Why? Because he publicly preaches heresy, not hiding it. If we look at every word of this Canon, we’ll discover its meaning. Preaching in the Church in public means imposing that line on the Church, and therefore on the believing people. So, the Canon says that what he preaches in Church are the ideas that he wants to impose on the Church, openly and without shame. So, the first step that we need to do is the one the Holy Fathers of the Church ask: if they do not repent and continue to act heretical, we are obliged to break communion with them. The fact that we broke communion with them does not mean that they have lost Grace, because we are not the ones who make the final decision, we do not judge; rather we make a break in communion with them because they were infect and they threaten to infect us with their disease. The Sacraments of the Church are not infected, but we are infected through Communion with an heretic, and his heretical teaching, and even though he is not ‘officially’ condemned as an heretic, he is certainly an heretic in the sight of God. For us he is an heretical because of such work. All we can do and you need to do is to break communion with him. There is another reason why we are working to convent a Synod of the Church.We demand that this Church Synod clearly pronounce on an issue, so that everyone can understand. There should be valid reason to cease communion with a Bishop; mention of bishops is necessary; he who doesn’t mention a bishop has a problem it is not allowed, with the only exception when a bishop openly preaches heresy in the Church as we said earlier. This explains Canon 15 and other Canons associated with it, such as Canon 13 and Canon 31 of the Apostles. S we are not talking about the invalidity of the Holy Communion of the heretics; however, the Holy Fathers made it clear that it necessary not to have communion with those who preach heresy, because is spreads heresy in the Church, and we do not wish to contract it. Interview: In what cases does economia apply? Economia does not apply in cases of dogmatic issues. We can apply economia but only to a certain point. 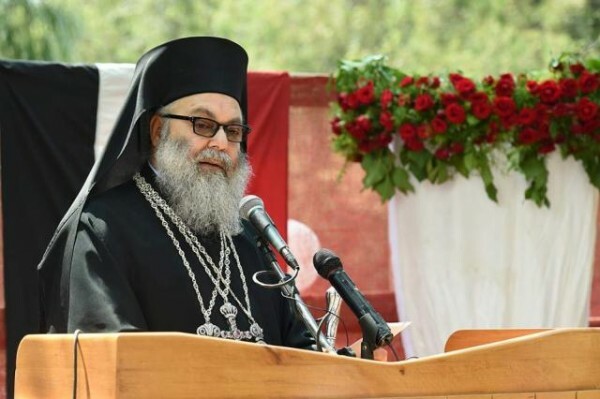 For example, the Athonite monks first announced that they would wait to see what the happens at the [Cretan] Synod], because we cannot make a decision before we know that the Synod decides. When we saw what was said by the Synod, we still waited to see what the other bishops, theologians, and priests would do. And when we saw this, and understood this, and what was the attitude of those stand before us, we will make a decision. That is economy. That is, we have to wait to talk first with the bishops. When we see what position is take by the bishops, especially if their attitude does not meet our beliefs, then it will be necessary for us to take a position. For 100 years economy has been applied in the Church; we can wait no long and apply it in similar ways as before. Why has the Holy Mountain not expressed its official position? For the same reason that the Greek Church, nor the Romanian Church, have made known their official position. Because they are trying to conceal the truth and hide! Because they do not want to allow people to find out what happened. Yes, those who voted for the decision of the Council, they know that what they have done is against Orthodoxy, and they know that the people will not accept it. This concerns dealing with all kinds of topics, and not just this one. They are hoping that people will not understand what happened. We’ll see in November, we’ll see in December, but in January, and then, what? after 7 years…? During that time, as it usually happens, the people will turn to other problems. All those voices that were raised against the Council will be muted, and the moment will come when those who have made this shameful decision, will, in silence, have it adopted. There problem is that if people understood what happened they would not accept it, they would be up against a nation; it will not be “big Bartholomew”, but people will pressure them, and they will loose their positions. So that’s the only way you can solve this problem, the only way to try to satisfy their superiors–they actually mire with the goat and the cabbage. That’s why I get up and speak out on the truth. And this truth, unfortunately, we must first tell to the bishops. It is a blessing wherever we bring the truth. And, of course, next week, you will read in the church the letter of your patriarch, in which he says that we came here univited and that we fled the monasteries and are fanatics and rebels, and we do not have a blessing for what we do. It is all a lie! I do not intend to justify or explain everything I do, but I do it with all mine heart; but, you should know, that we have not fled our monasteries, although they might want to expel us for the fact that we speak the truth. Second, from whom did we receive a call? We got the call from you, as you bishops are hiding secrets from you. And yes, we came with the blessing of you father and priest, Father Gabriel from Kutlumusa, who was a disciple of St. Paisius of the Holy Mount, and the spiritual father of Julian, a priest of the Athonite Romanian Skete of St. John the Baptist. They are true confessors. And they are two of the many monks who disagree with the decisions of the Cretan Synod, and are not afraid to lose their position, and are not afraid to practice their religion. I emphasize that we are especially blessed for those saints who testified to the Faith without asking for a blessing to do it. St. Maximus the Confessor, who had given him a blessing in preaching and professing the Faith? St. Gregory Palamas was in prison, and who put him there? Kalekas Patriarch of Constantinople [John XIV of Constantinople]. Therefore, according to which should there be obedience? The Holy Martyrs, before they began to profess the Faith, did they take a bishop’s blessing? It may be that they want to say such is prelest or foolishness. Christ the Saviour says we need to confess our Faith. He commands us so we ought to do that. Is it possible that a man should ask his priest’s blessing to profess and practice his religion? What if the priest tells him “No”? Should he remain ‘obedient’ to him? St. Theodore the Studite says that a monk should work– to fight for their faith when it is in danger. 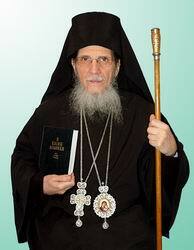 St. Nikodemus of the Holy Mountain says that when bishops are silent that monks must speak against them. But we have forgotten that we are now living in a Post-Patristic period where it is said the Fathers have no importance, and that we are fanatics. However, we are satisfied that they have described us as ‘fanatics’, because according to them these two holy Fathers [St. Maximus and St. Gregory] are fanatics too, but they did what they did! What to do, when God made us with such fanatics! Do you agree that if there is leniency towards heretics it will like prey to the wolves, according to the teachings of St. John Chrysostom? This is so true. Yes, we have become a prey to the wolf. We are in a very difficult situation: economy for the heresy of ecumenism dates back 113 years, that is, to 1903. We have been patient enough with economy, and we cannot continue. If we do not break with such practices, the result will be a common chalice with the Papists, and they will keep telling us to use economy. We cannot allow economy any further. The Fathers, when someone was just an heretic on one point, would cease communion. Today, Patriarch Bartholomew has surpassed all the heretics, and the Church follows him. It is believe that the Koran is holy and sacred as the Gospel, and that those who follow the Koran can be saved; he feels blessed in the Jewish synagogue, and says we have the same God with them; it is taught that all religions are the way of salvation, which is a great blasphemy, because it totally rejects the Saving Role of Jesus Christ? Then why did the Saviour come to Earth? If other religions offer salvation, He did not have to come. And many other heresies Bartholomew continues to preach and to speak of all of them, we would have to sit here for hours. No; we cannot continue in economy. Father, would it be a good idea to organize a large protest against ecumenism? Would this be the will of God? Everything that is done out of a love and calmness as an act of God is blessed, without any fanaticism, although we are already classified as ‘fanatics’. “Fanatics’–why? Because we want to keep the Faith? But it may be that they are right, because, in according with the law those who support the truth are guilt and should go to jail. By the criterion we are Orthodox fanatics. Murderers, homosexuals, and all ‘sexual minorities’ have a right of action without limits, and no one calls them fanatics, but we are ‘fanatics’. The ‘Orthodox’ Synod [i.e. 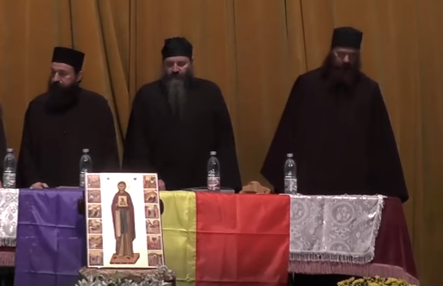 Crete] does not condemn heretical priests or bishops, because for years they pray together: Patriarch Daniel, with other bishops of the Romanian Orthodox Church. Does the hierarchy of our Church, which supports ecumenism, automatically get deprived? We are trying to inform people that there are honourable bishops. You need to support them, to inspire them, so that they can support us at any given moment. I agree with you, but the problem is not the bishops. The problem is the people. How are Christians interested in the problem of the Synod? If they showed interest in the problems of our Faith, do you think that the Bishops could do what they did? This it he problem. The problem–it is us. If people were interested, we would not have come this far. When believers go to church, the situation is quite serious, because the priests do not tell the truth, but follow the policy of the Patriarchate. We feel like we’re going to church for nothing, because our problems are not taken into account. What should we do? I know this because the same thing is happening in our country, and what we doing now is a step forward. The public is told that they should not listen to our talks because we do not ‘have a blessing’, and that we should listen to our superiors. Of course, this is not in harmony with the Gospel, and we do not follow such mandates [i.e. those not in conformity with the Gospel]. When Faith is in danger, we are not bound at any cost to be ‘listening’. What should we do? First of all, we need to pray. Nothing is as before, we have no support, nothing concrete. We’re entering that period of our Church, in which we have to constantly fight for our Faith. It’s nothing bad, it’s a blessing from God, for those who want to show love for God, and have the opportunity to present themselves as the confessors. If we go to Sunday Liturgy and indeed we read a notice which tells us that you are not obedient, what position should we take, which you do not consider to be fanatic, but at the same time expressed our thanks to God? If you speak in Church, they will tell you that you are fanatics and you will have problems. But if you do not speak in church, you’ll be tacitly agreeing with what they are saying. The fact is clear that what you do, you will be labeled somehow. We need first of all to pray for these people that God enlighten them, and above all, today, we have to be careful. We do not create enemies ,and do not consider them enemies. If we classify them as our enemies, keep your passion. We are fighting against heresies and heretics, and ask God to enlighten them, otherwise all meaningful prayer will be lost. The only way to show yourself and others, and to God, that we are not ‘fanatics’. For this reason, if our fight was inspired by the Holy Fathers, according to the teachings of the Church, our prayers need to be placed first. Let’s say that I as a monk does not want to mention an ecumenist bishop, or rather atheist according to St. Gregory Palamas. I’ll go out of the monastery and be deposed. Do I have Grace after this? Can I thereafter serve the Divine Liturgy? What is in accordance with the Canons? Bishops can do it. It stands in the canons. But, first, they need to fix themselves, and especially Bartholomew, who has been hit by ALL THE CANONS of the Church, and all the Sacred Canons. And if a priest was deposed because of Religion, it is to no effect. I do not say this, but the Holy Fathers. When a person has been deposed because of their Faith, this action has no power, and they can continue to serve the Divine Liturgy because they are canonical. The bishops say that if an hierarch is not mentioned in the Liturgy it is not valid. This is blasphemy against the Holy Ghost. It is the ultimate blasphemy. It is as the Pope says: “If you do not mention me, then you are not in the Church.” The Church Canons are very strict on this point, and say that we cannot mention in the Liturgy an hierarch who does not rightly divide the word of truth [i.e. you cannot mention an heretical hierarch]. This theory of a bishop having to be mentioned in Divine Liturgy and if not it is invalid, is contained in the theology preached by the Metropolitan of Pergamon, John Zizoulas, which is copied form papostical theology. He introduces to us a different theology, an heretical course, which is entitled ‘episkopocentrism’. This episkopocentri Liturgy, that is, that you must have a bishop who stands in the center instead of Christ the Saviour, that is, they not to Christ the Saviour but to the Bishop, do you not realize that this is blasphemy? On this principle rests papism. Papal primacy is built on that basis. So, when you leave the ecumenists, it is instead a great blessing. What do we do if none of the Bishops want to give up the heresy and decision of the heretical Synod? In what church should we go to confession and Communion? Do we want to come to a schism, but what can we do? Nobody wants a schism. St. John Chrysostom says that the schismatics from the Church cannot wash themselves even with the blood of martyrdom. It is a terrible things to make as schism in the Church. However, Canon 15 of our Church clearly shows that those who stop commemorating bishops who preach heresy in the Church, even before a Synodal condemnation, not only do not make a schism in the Church, but also protect themselves from these bishops. Please note: they distance themselves from these bishops, but not from the Church–in practice, in fact, they cleanse the Church from the schisms and heresies of pseudo-bishops. The pseudo-bishops are not in the Church of Christ. Does the Church of Christ have pseudo-bishops? Why should we not follow them? Because they are called by the holy fathers ‘wolves.’ Can any of you stay close to a wolf? You cannot, because you will be eaten. If we would not be eaten, then we have to be removed from them. You should find a priest who will not commemorate them, and go, and continue your fight, as did the first Christian, when there were problems in the Church. I spoke earlier that we do not know the history of our Church. So far, so good. At this point, we enter a difficult period of the Church, where it will be necessary to wage a fierce battle for our faith, the struggle is the characteristic of the saints, and the ancestors in ancient times. Therefore, we cannot be pessimistic, nor ask what to do. God will provide, and direct the Church of Christ the Saviour. Our job is to do what is necessary, and the Saviour Christ will give us a solution. We will do that which is within our human power, and God will help us through Christ our Saviour. In Romania, as in Greece, there are Old Calenarists. What do you think about them? Do they have bishops, priests, and Orthodox practice? The problem is that some of these groups do not have canonical cherothonia. That’s why I told you that this will all have to be discussed in a future Synod, and all these problems should be solved then. The error committed by the Old Calendarists is that they formed their own Synod. It would therefore be necessary to convene a Synod to clarify this issue. As between us and them, however, there is no dogmatic problem, and we could easily be able to unite. Is there an automatic loss of Grace? Automatic loss of grace is something from the Papacy. For us it does not exist. Therefore, the Dioscorites or Nestorians, some of the greatest heretics, while preaching their heresy, yet not expelled, are understood in the same ways as those who were ordained. That is, the consecration which they carried out, although they are preaching heresy is recognized. This is demonstrated in the history of the Church, and therefore they are called to a Synod to repent of heresy, otherwise there would be no need to convene a Synod. Otherwise, in the Church anarchy would hold sway, and the principle of arbitrariness could say: “Here there is grace, here this not.” We do not need to do that. The Church needs to act in a conciliar fashion. A Synod must depose the heretics from their rank. He is still the enemy of God, but, until it becomes official, we cannot say they do not have Holy Communion. Decades ago the papal idea infiltrated, though, we believe the Grace was still in the Bishops, and passed through them, though they are not worthy of the Grace. If it was an immediate dissolution of Grace, then it looks like it is an electric cable through which current flows. Through it passes Grace, like an electric current, and if you cut the cable, nothing will happen. When a bishop is not worthy, God’s Grace goes through him, and still goes right to the people. The heretic, if not deposed, will still have a true Eucharist. I’ve already said we are moving away from him, and we will not participle with him in the Liturgy, and will not long have contact with him, because there is a risk that we will be infected by his heresy. If we are in communion with him, we take part in his belief. The Liturgy is the fellowship of Faith, because we saying at the Sacred Liturgy, we confess “Father, Son, and Holy Spirit, Trinity one in essence and inseparable.” And those who do not confess the Same God cannot jointly participate in the Divine Liturgy. Is there a “Christian atheism” in the Orthodox Church? If so, what is the meaning of this? Yes. St. Gregory Palamas describes to us three types of atheism. The first type of atheism is classical atheism, i.e. someone who does not believe God exists. Another type of atheism is heresy. Why is heresy atheism since the heretics believe in God? Let us ask ourselves: Is the one in whom they believe God, or is it a false god? The third kind of atheism is when we Christians remain silent when our faith is in danger. And this kind of secularism is manifested in our time. Though our faith is in danger, we were told to keep silent, listened to the radio. This means that we will be classified as atheists, if we do not speak about our Faith. It is not I who says this, but St. Gregory Palamas. But if a Bishop falls into heresy, but we do not know any priest who is stopping commemoration, should we remain in communion with him, or should we cross hundreds of kilometers with children, going to another country, or even move to another place, in order not to fall away from the Faith? Thank the Lord for the fact that the Saviour Christ stands at the Head of the Church. Our job is to stay true to the Faith. What will happen with the bishops and priests, the Lord will determine. The important thing is whether we can preserve the Faith. Everything else is God’s work, the work of the Saviour. We should have not only Faith in Christ the Saviour, but also confidence in Him. To be convinced that the gates of hell shall not prevail against the Church of Christ the Saviour, this were were told by the Savour. Therefore, we should not be anxious, we should do what is in our power, continue the fight, knowing that the real victor is Christ the Saviour. -I’m stupid, replied the elder. You’re a brigand, he told the elder. “I’m a brigand,” agreed the elder. “You’re an heretic,” he said. “No, I am not an heretic,” replied the elder. Then he asked the elder why he agreed to everything but not the fact that he was an heretic. The elder replied that, as a man, he was subject to all sins, but that an heretic is one who opposes God. And he was not opposed.